In 1853 the Collamore House opened on the northeast corner of Broadway and Spring Street. For nearly half a century the five-story stone-faced hotel hosted travelers as well as well-known names like Stephen Foster. But as the century drew to a close the theater and shopping districts had moved northward and the area became increasingly commercial. In November 1895 real estate operator Joseph L. Buttenwieser purchased No. 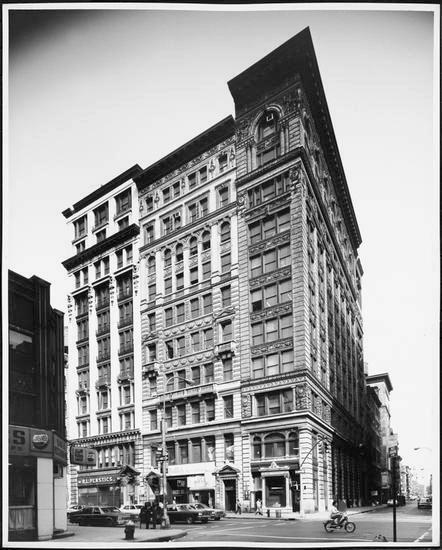 530 Broadway for about $165,000--a substantial $4.8 million in today's terms. It would be a year and a half before he demolished the old hotel and, on May 1, 1897, began construction of his newest office building. Buttenwieser commissioned the architectural firm of Bronner & Tryon to design his 11-story skyscraper. 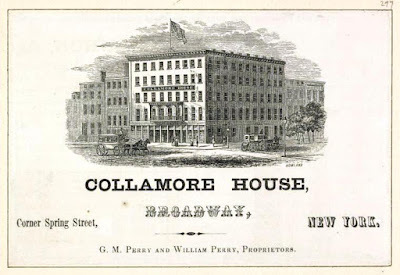 The 25-foot wide plot stretched 100 feet down Spring Street, resulting in what would later be termed a "sliver building." Construction was completed in just under 10 months, on February 27, 1898. The height of the structure was made possible by the most modern of construction technology--a steel skeleton, curtain walls and hollow tile arches--hidden behind a Beaux Arts and Italian Renaissance facade. The three-story base of rusticated Indiana limestone supported eight stories of gray brick. Wreaths, leafy swags, blank medallions and a band of fleur de lis below the fourth floor cornice decorated the stately facade. Not only did Joseph L. Buttenweiser move his offices into the new building, so did real estate developers Julius Dreyfus and Osias Kanner. Most of the tenants, however, were involved in the apparel trade. In May 1902 Buttenwieser sold the building to the Provident Savings Life Assurance Society, which had recently purchased the adjoining property at Nos. 532-534 Broadway. If the purchases raised suspicions of a new office building on the combined sites, they were soon put to rest. Tenants in No. 530 Broadway at the time included Charles F. Stower's ladies' neckwear factory; and "resident buyers" Husband & Farmer and P. J. McCarthy. Resident buyers acted on behalf of department stores and other retailers throughout the country, relieving those firms of the need to send buyers to Manhattan. In 1904 the Singer Manufacturing Co. opened a showroom in the building. In addition to Husband & Farmer the tenant list now included Langfeld Bros. & Co., a Philadelphia-based "fancy leather goods" manufacturer, and Chas. C. Starr, dealers in harness and leather goods. The founder of Lanfeld Bros. & Co. died in 1906 as the age of 92. Born in Zeckendorf, Germany, he started the firm in 1868. The company continued for another decade, before dissolving in January 1916. Sixteen of Lanfeld's current and former salesman gathered for a farewell luncheon in the Vanderbilt Hotel. The speeches that afternoon were nostalgic. Notions and Fancy Goods reported on several of them in its January 1916 edition, including that of Millard E. Heise. "He recalled some of his early traveling experiences, when comforts on the road were as scarce as snowballs in Hades, dwelt humorously on the corn husk mattresses of former days, not forgetting that the water for bathing was usually ice cold while the drinking water was invariably warm." The operation of wealthy clothing manufacturer C. J. Steinau was in the building by 1910. He and his chauffeur, John Deans, would become central to a vehicular homicide case in August that year. It started when Dean picked up his employer and another man on the evening of August 18 and headed north along the Pelham Parkway. Earlier, Grace Hough, George Fedder and Anna McCabe were riding in an open buggy. Suddenly the automobile of wealthy needle manufacturer Edward T. Rosenheimer sped toward the horse-drawn vehicle. With him was an employee, Milton Fleischer. The heavy car smashed into the carriage. According to testimony later, "The victoria was crushed into splinters, and this big touring car, driven at terrific speed, must have passed completely over it and under the three occupants shot high in the air in three directions." Grace Hough was killed immediately and her two companions injured. Rosenheimer, nevertheless, sped on, leaving the gruesome scene behind. Moment later Steinau and Deans arrived at the site. Residents had rushed to the scene to give aid. Deans testified "When he reached the spot he stopped the car, to find a woman lying in the roadway with a blanket folded under her head and another woman bending over her." He said he could "see readily that the girl lying on the ground was dead. The carriage was smashed and the horse was lying on the embankment at the roadside." The chauffeur returned to the limo and informed Steinhau "This woman is dead, an auto has struck the carriage and just disappeared up the road. Shall I go after it?" Steinhau and his companion jumped out to help the victims and Dean sped after the escaping vehicle. At a time when speed limits were 5 miles per hour, the chauffeur pushed the big car to nearly 70 mph. After a long chase he overtook the Rosenheimer car when it pulled over. A man was attempting "to fix something near the steering gear." Dean shouted "Do you know that there has been an accident down below, and that a woman is killed and her two companions hurt?" He got no response. Seeing that the front of the automobile was "considerably smashed," he added "If you are men you will go back to see what has happened." With that Rosenheimer jumped back into the automobile and "opening up the power, sped down the road and disappeared." Deans, however, had memorized the license plate number. The chauffeur drove until he found a policeman. He gave an accounting of the accident and the plate number. Rosenheimer, who had inherited over $1 million following his father's murder, was arrested, as was Fleischner. Despite the heavy damage to the big automobile, both denied knowledge of the accident; although at trial Fleischner said he remember that that they may have "skimmed" what he assumed was a wagon. In questioning the witness Coroner Schwannecke was "fairly bubbling with wrath," according to The New York Times on August 20. "You are such an infernal liar that I am not going to ask you any more questions at this time." Both John Deans and his employer were important witnesses in the murder case. Rather astoundingly, Rosenheimer was acquitted on all charges. Justice of a sort did prevail when three separate law suits for damages forced him into bankruptcy in August 1912. A rather startling incident occurred in August 1922 when tenant John Moker sent his chauffeur to the Automobile License Bureau to renew his license. Patrolman Lawrence Walsh was on duty at the Bureau at No. 127 West 65th Street that day, and asked Clarence Smith what he needed. Noting that the man was on the wrong line, he said "You should go to Window 12." Smith was apparently not having a good day at the License Bureau. The Times reported that as Walsh turned away, "Smith, without giving any warning, drew a penknife and stabbed the policeman twice in the left side." The policeman, who had been married for just three weeks, managed to take Smith prisoner to the West 68th Street station house, "and then collapsed." He was treated at Flower Hospital and sent home to his bride. For the next few decades No. 530 Broadway would continue to house apparel related firms--such as Lady Ann Hat Co., the Handel Sportswear Co., and Landor Sportswear in the 1940s; and Bert-net Thread Co., the Orzel Corp. and The Craft Emblem Corp., and Bar-Men Undergarment Company in the 1950s and '60s. The last quarter of the century saw a change in the Soho neighborhood and the Broadway-Spring Street area became a center of performing arts studios and lofts. In 1973 the Film and Dance Theater opened at No. 530. Bronner & Tryon's handsome 1898 sliver building is little changed in a neighborhood which cannot say the same.